As part of the efforts to improve the Pacing efforts, we had initiated a Facebook group for the specific purpose of having the pacers and runners interact before the event. Such interactions bring about a bond between the pacer and the runners who intend to be in his bus. After the event we then asked for feedback from the runners and the following are the comments that were posted. Neelam Vaid: Excellent idea. Especially for someone like me who was running her first race. Now cant imagine running without a pacer. We need you guys. Thanks Venkat and Ravi. Sanjay Limaye: I had fantastic experience with Preeti who lead the ‘Peloton’ with great precision. I know precision is bit strange word for the distance of 42k & 5 hours. But I can’t find any other word for her pacing plan & actual what happened. Only one things I am curious of is two different Pacers have entirely different pacing strategies. So how does a newbie decide which one to join? Delhi Rommel: The whole idea of pacing was JUST great. I liked the idea od pacers wearing their kit on EXPO day, other runners were able to know and interact. Pacers this way were more approachable. Expert advice on wearing the pennant was real help before the start. Good to see Venkatraman Pichumani before the FM start to help us out. Sadly due to the commitment in organizing team missed the opportunity of interacting with the superb set of PACERS. During the run all three 4:30 pacers had different strategy to cater for different training requirements of all. 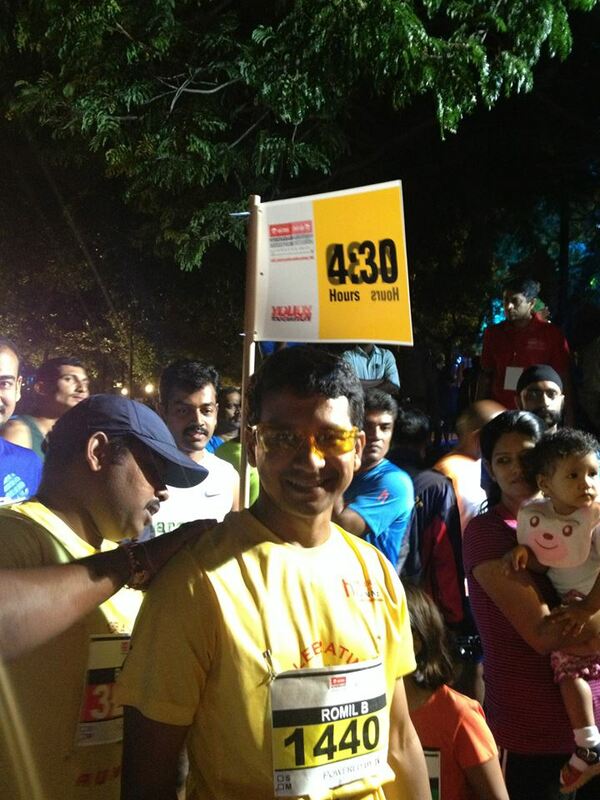 Thoroughly enjoyed the whole experience and hope the runners benefited too . Kapil Gokhale: Hi Venkat Sir. It was a difficult run for me. I could not keep up pace with you and lost your company just before 6.7km board. I have analysed my run and know areas of improvement. The onus of difficult run is on me. I was really looking forward to run with you. Next time. I had a question regarding pace strategy. We lost 4min morning time at start and hence kept pace little higher(7.5?). Would it have been possible to run at little slower pace even at start? If slower runners like me are able to cover more distance with you, will it be a boost psychologically? Venkatraman Pichumani: Kapil, sorry about that. I made up for the 4 minute loss in start time over the next 6 kms. I also gave walk breaks in EVERY single water station & gradient. I also thought that with the weather being exceptionally cooler one could take advantage of the morning crisp air before it starts turning sultry. As you can see every pacing effort is a mix of strategy and en route tactics. Laxminarayana Yepuri: Great to have these exceptional pacers and they put our mind at ease to make sure we will finish the race at target time. Thanks to Ravi and Shiv. Kavitha Elamvaluthi: absolutely flawless execution of 5hr bus byPreeti Aghalayam ! full credits to her for making the 5hr target posible which inturn id many of our PBs!! Venkatraman Pichumani: Kavitha Elamvaluthi in the photo that I clicked and in which you tagged yourself, both of you and Preeti Aghalayam are smiling. Hers is the smile of having a burden well discharged while yours is that of a difficult goal vanquished. Vivek Gopalpuria: This was my first HM and I got a lot of guidance from the pacers team… Thanks to all of them for bearing with us and helping us through the event… Would like to extend a special thanks toDelhi Rommel; Venkatraman Pichumani; Shiv Shankar Kosgi……….. My one suggestion would be.. may be we can start the pacers thread a month or two in advance so that we get a lot more discussion topics/ learning passed on..I believe it would be worth it…. Praveen Giriya: Get rid of the pole and bottle concept for the pacer its highly uncomfortable for continiously running along with it for 2-6 hrs ..think something which suits the pacers with Preeti AghalayamManivannan Vangalur ..also 300-400 meters was more which the race orgainsers atleast should have told the pacers so that they could have guided the bus home before time ..Just my two cents ! Delhi Rommel: I agree 100% with Vivek Gopalpuria, we could have started earlier. Praveen Giriya: Great Job done ,well planned and executed by the pacers U rock Preeti with you run walk strategy, u once again proved that it is one of the best ways to run a full marathon & Mani- u were awesome -One of the most sought after ,dream bus for many sub 2 finish ..u made their dream come true …happy n proud of u both and other fellow pacers -awe inspiring. Patrick Pitchappa: The concept of pacers and the implementation of the same was awesome! Thank you so much Venkatraman! Jagadeesha Kp: sure Udaya Napa…we enjoyed your company…more over we are proud of your consistency, confidence…professionalism…great job…same for Jaikant Kumaran..Delhi Rommel…even though I did finish 19 minutes later than your BUS….thank you guys once again…. 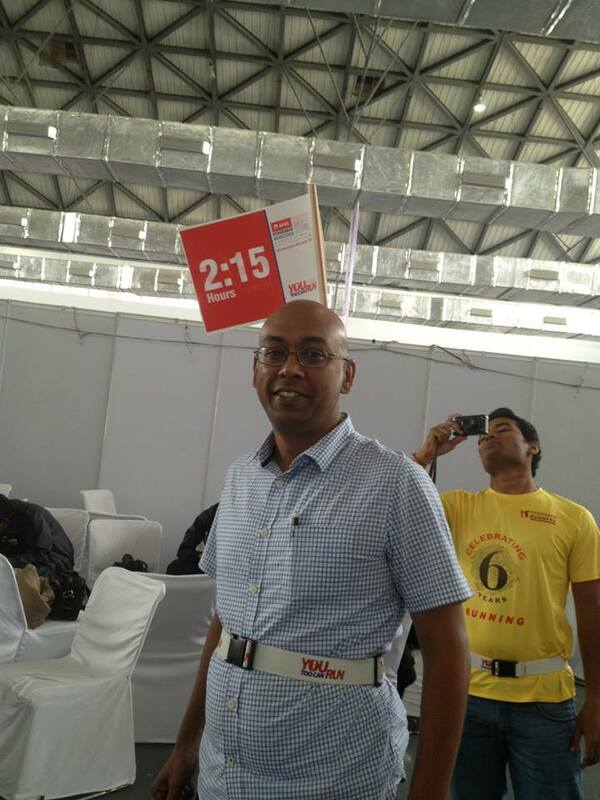 Aravind Kumar: Kudos to all you pacers. Planning so meticulously and executing with such precision. Was good to meet U, Udaya. Excellent run. Aham Brahmasmi: AWESOME and Nice way to give back something to the running community ! Delhi Rommel: Great work Udaya Napa and Jaikant Kumaran . It was a treat seeing your consistency wonderful work, cheers. Jaikant Kumaran:Udaya and Delhi Rommel it was great running alongside both you awesome runners! And thanks to all the runners who gave us wonderful company through different stages of the race. It was a wonderful experience. Udaya Napa: Thanks Delhi Rommel and Jaikant Kumaran. It was a pleasure to run with you. Kiranmai Kondaveeti: Pacers…… The team did a wonderful job, you all made our mind game to work automatically without mental strain…… It’s Awesome to have you and u all are inspriational too…. Thanq so much once again.